Our union is proud to have acted in solidarity with Teamsters Local 814, which represents about 40 drivers, helpers, and warehouse workers who were locked out on July 5th and replaced with cheap subcontractors after Waldner’s refused to negotiate a new contract for months. Local 814 members have since been picketing Waldner’s clients, asking them to drop the large office furniture supply company and demand that they negotiate with their union workers. On July 27th, our union members arrived at our downtown Brooklyn office location to find locked out Teamsters outside. They had traveled from Maspeth, Queens, trailing the Waldner’s replacement workers as they attempted to deliver furniture to the office manager in a building where our members work. We honored the Teamsters’ request that we not cross their picket line and enter the building. Instead, our members grabbed our UAW wheels and joined their picket line! We picketed with the Teamsters until the replacement workers left. Your solidarity, along with so many others, was instrumental in our victory. 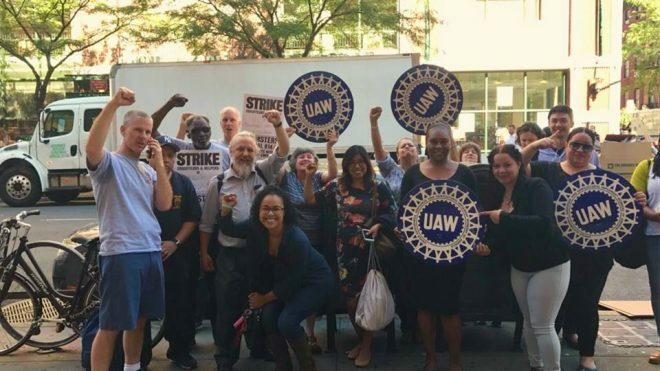 Special thanks to your members at the Court St office in Downtown Brooklyn who saw our members picketing a scab delivery there and quickly joined the picket line en-masse, complete with signs and banners. Their militant display not only lifted our members spirits but lead to the building manager calling Waldner’s and threatening the company with the loss of an important and long-standing account. The settlement that you helped us achieve guarantees that Waldner’s will continue to provide New Yorkers with good, union jobs. Teamsters Local 814 proudly settled the lockout on August 30th. Under the agreement settling the unfair labor practice lock-out, Waldner’s committed in writing to use companies that pay their workers fair wages and benefits, and Waldner’s secured jobs for former employees at those delivery companies. Under the agreement, workers will also receive significant severance, in many cases equaling thirty weeks’ pay. We are proud to have been able to support our union brothers and sisters of Teamsters Local 814.